Greenhouse Accessory Reviews | Items needed for a happy greenhouse. Some Great Reviews For Your Favorite Greenhouse Accessory! Find your favorite greenhouse accessory below. I’m sure that you will find items you will probably need to keep your greenhouses functioning and problem free. All of these products have been vetted extensively to assure maximum satisfaction! Take a look. And, be pleasantly surprised! You can’t get any better greenhouse plastic covering! This 6-mil thick polyethylene is exceedingly rugged and robust. This thick and durable product is absolutely guaranteed to last for 4 years…and, some gardeners have been able to get as many as 8 years use out of it! 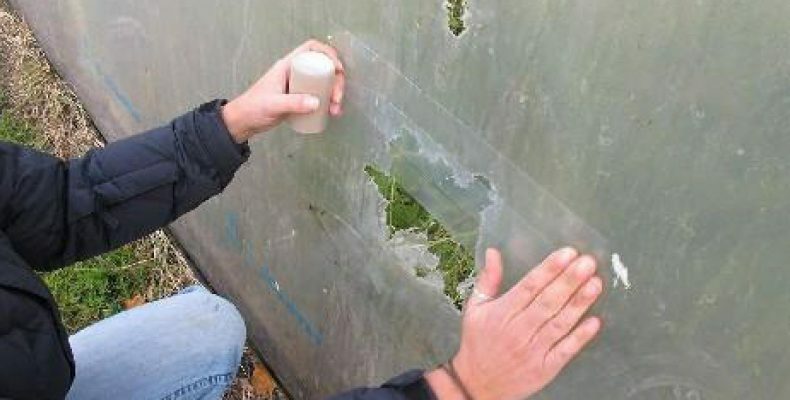 One customer recounted how his greenhouse plastic from Grower’s Solution survived 70 mph winds during a tornado…with just several small tears and a few dents from the hail…an easy patch job! TIP: Spray off the covering once a year with soap and water. Cleaning off the dirt and mildew will definitely extend the life of the plastic! This plastic has a high light transmission percentage which is advantageous to increased plant growth. And, it has an infrared additive to stabilize the greenhouse environment and reduce heat loss. If you use this greenhouse covering over a greenhouse made with PVC pipe, make sure to add a good quality primer to the pipe wherever it touches the plastic. Or, wrap the PVC pipe with a polyethylene-based insulation. PVC, especially the electrical conduit, can out-gas chlorine…which destroys the UV light stabilizers in the polyethylene…degrading the plastic. Any treatments…pesticide, fungicides, etc…that contain sulfur or copper. The bottom line is…you will void the 4 year warranty if the polyethylene plastic makes direct contact with PVC pipe. This Clear Polycarbonate Greenhouse Cover is 4 millimeters thick and will give you 82% light transmission! A thickness of 4mm is ideal for new installations or replacing damaged sheets. Thicker materials will considerably lessen the amount of light received by your plants. These POLICARB covers are double-walled to retain heat and diffuse sunlight so that even the plants in the far corners of your greenhouse get their share of the sun’s benefits. Polycarbonate covers are also several hundred times more durable than glass….virtually unbreakable, high impact, and strong…very strong! They are extremely easy to cut into shapes and panels for your greenhouse. The average cost of this polycarbonate cover is about $2.15 per square foot. This is a very versatile plastic fiber pipe wrap product! Since it does not contain fiberglass, gloves and masks are not necessary to use during applications. Originally designed for insulating hot and cold pipes from winter freezing and summer sweating, this pipe wrap insulation is perfect for protecting greenhouse plastic from rubbing against the frame’s hard pipes and interconnections. The pipe wrap will also keep a heated frame from baking and destroying the plastic cover. Both of these positive attributes aid in slowing down the plastic’s natural degrading over time. I personally keep at least a half dozen rolls of this Duck Brand 1285244 Pipe Wrap in my garden tool shed! This UV stabilized tape, by Uno Plastic, is the industry standard for repairing greenhouses. 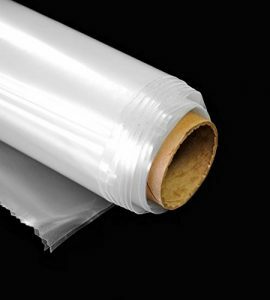 The tape boasts a very high tensile strength, aggressive, acrylic adhesive…and, with its exceptional durability and holding power, it’s great for mending rips and tears in greenhouse plastic. Acrylic adhesives are known for their resistance to chemicals, temperature changes, and exposure to the elements in a variety of weather conditions. This tape is strong and sticky enough to splice large pieces of greenhouse plastic together to make a more custom fit. I have even used it for a temporary cracked glass repair! This Uno Plastic tape is perfect for so many types of repairs that I would not consider another brand. When you click on the BUY NOW link, options will also be shown to purchase 2 inch and 6 inch wide rolls, if that better fits your need. Snap clamps are the easiest and most efficient means to securely attach greenhouse plastic to any type of pipe frame, including PVC. Snap clamps for both 1/2 inch and 3/4 inch diameter pipes are available from Circo in bags of 10. TIP: Snap clamps should be placed about 6 inches apart on a greenhouse pipe frame. So, take that into account for determining how many you need for our greenhouse. These clamps make it quick and easy to attach not only plastic…but tarps, shade cloth, or netting…to pipes. Circo’s snap clamps are UV stabilized and frost resistant. They will last for many, many years! And, they will not harm or decay greenhouse polyethylene plastic. Buyers have noted that, after trying almost everything else to secure their greenhouse plastic, Circo’s snap clamps are the only thing that did the trick…through all kinds of wind and weather! Want to know the best way to heat your greenhouse during a winter cold snap? The DR218-1500W heater will keep greenhouse plants from freezing. This is a powerful “fan force” heater and it is permanently lubricated for life. It has a fully enclosed, thermally protected, heavy duty ball-bearing motor. The body and support frame are made with heavy gauge steel. Standard in this amazing little lightweight and portable heater are also: 1) a precision sensor, 2) an adjustable thermostat control, and 3) over-heat protection. For all those gardeners with plants spending the winter in the greenhouse…you really DO want at least one of these Dr. Heater 1500W infrared heaters! This is the absolute best infrared heater on the market! There you have it! In these reviews for greenhouse accessories, I have covered all you need to accommodate the greenhouse of your choice! Let me know what you think of these greenhouse accessories with a comment below or an email to me: jim@perfect-vegetable-garden.com. Great review about greenhouse accessories for repairing and customizing a greenhouse. I love to garden and I have always loved the idea about having a greenhouse. Do you think it easier to build your own greenhouse or buy a kit? With a greenhouse a person can be an active gardener all year round, save money over the grocery store produce prices and know that your food is free of harmful pesticides, and tastes great. If you have carpentry skills, I’m sure you can build a good, solid greenhouse. But, by the time you take into account the material cost and time involved, you may want to consider buying the kit for a few dollars more and a lot of time saved. 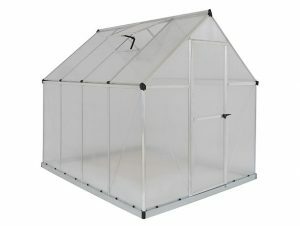 For all of the DIYers, I will be offering a view into building a small, portable 8’ x 4’ x 4’ greenhouse in the near future. I estimate my material cost to be less than $50 but, we’ll see how it goes. Greenhouses are excellent additions to every serious gardener’s arsenal of growing tools!